There were no signs leading to our destination. We only knew that it was located about twenty miles from the Salton Sea, and cell service was spotty at best as we kept an eye on our GPS. We rolled into Slab City well after sunset, and driving unfamiliar dirt roads after dark is always interesting; entering an off-grid community in the middle of the Sonoran Desert only added to gnawing trepidation. 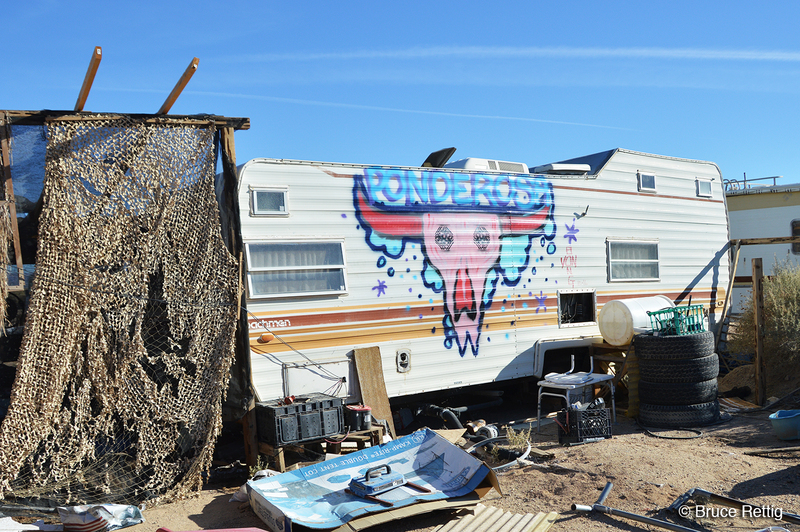 Finding an Airbnb listing for Slab City was a surprise, to say the least. I had my concerns. Was this the same desert wasteland community portrayed in the book and movie, “Into the Wild.” Would we thus be seen as pathetic voyeurs, and strongly shunned? Or maybe it was a place where meth-induced squatters survived under the radar, preying on hapless travelers. I had heard varying stories and fought to keep my imagination under control. 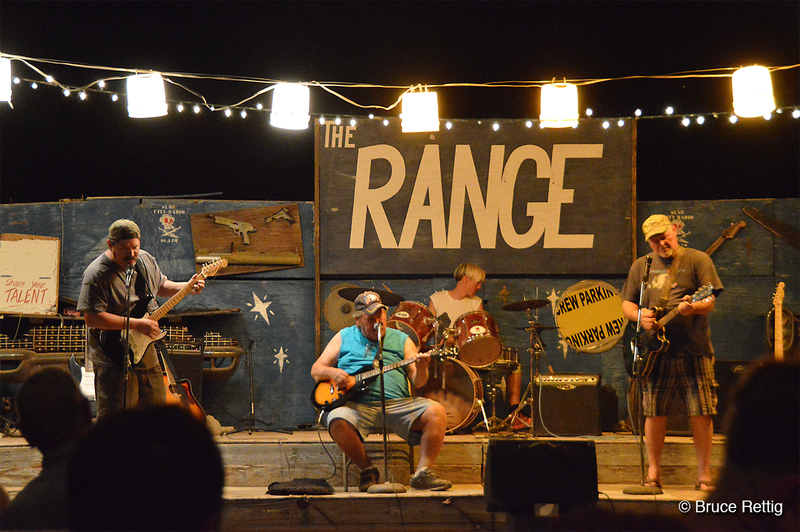 After passing a “city” sign, a warm glow appeared and we arrived at The Range, Slab City’s outdoor music venue. It’s basically a stage between two buses with strings of lights encircling the area. The audience sat in torn couches and worn chairs, some of them with dogs at their feet. An eclectic range of entertainment drowned out the generator’s constant drone. My body relaxed after the long day’s drive. Under the starlit desert sky, music wafting across the stage, I fell into a sense of comfort, surrounded by people enjoying that exact same sense of peace. The area where we sat once served as an American Indian fish camp. Bounties of fish and shellfish were harvested centuries ago from Lake Cahuilla. It later became Camp Dunlap, a Marine training base. 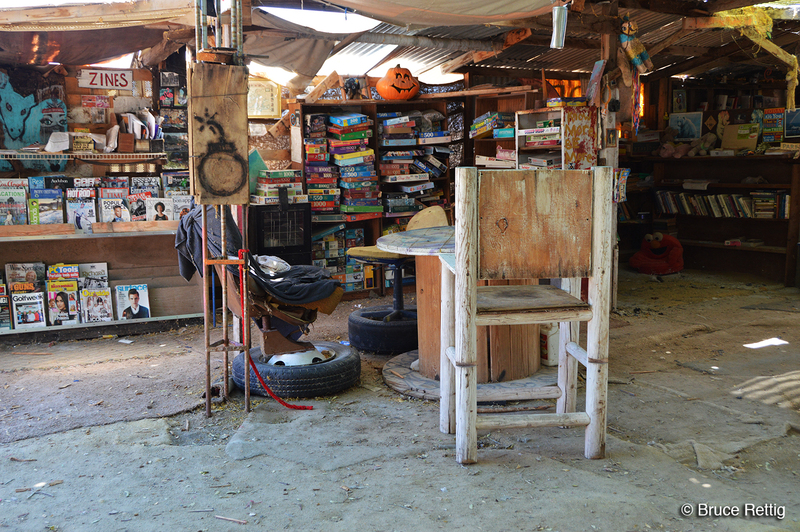 The military vacated it after World War II and left concrete slabs behind—thus, the name “Slab City.” It’s now a free campsite and alternative living community, a place where living space is often designated by outlines of rocks, scrap wood, and old bottles. Depending on the time of year, several hundred to a few thousand people live on the 600-acre patch of land. In short, it’s the last free place to live in America. After connecting with our Airbnb host at The Grange, we made our way to The Ponderosa, our accommodations for the night. Our host was gracious and covered all the details of the RV where we’d sleep, such as how to use off-grid facilities limited in water and energy. Climbing into our sleeping bags, we quickly fell into a deep sleep. 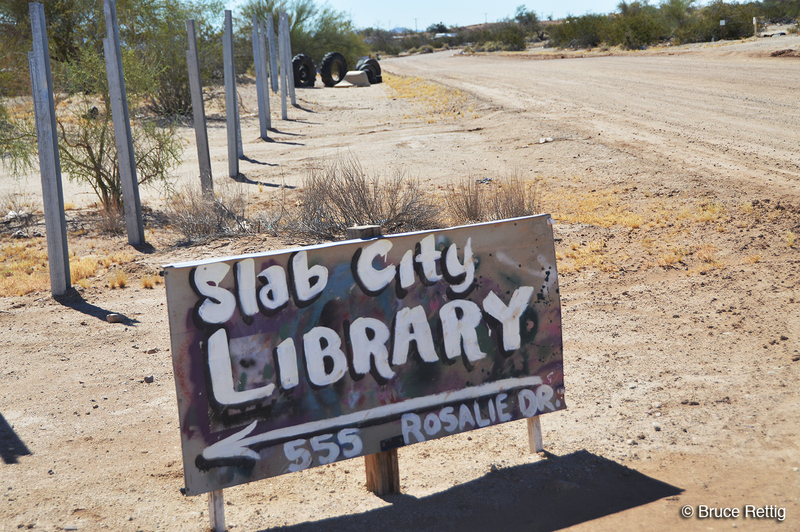 The next morning, our host toured us around sites of interest including the Slab City Library, Coliseum, skate park, and water tower. As much as I try to maintain proper etiquette as a photographer, I sometimes fail—this was one of those times. While snapping shots when entering the library, I was sternly reprimanded by the librarian. “How would you like it if I walked into your house and started taking pictures?” she blurted. She was right, and I apologized. I’ve always gotten into trouble with librarians. 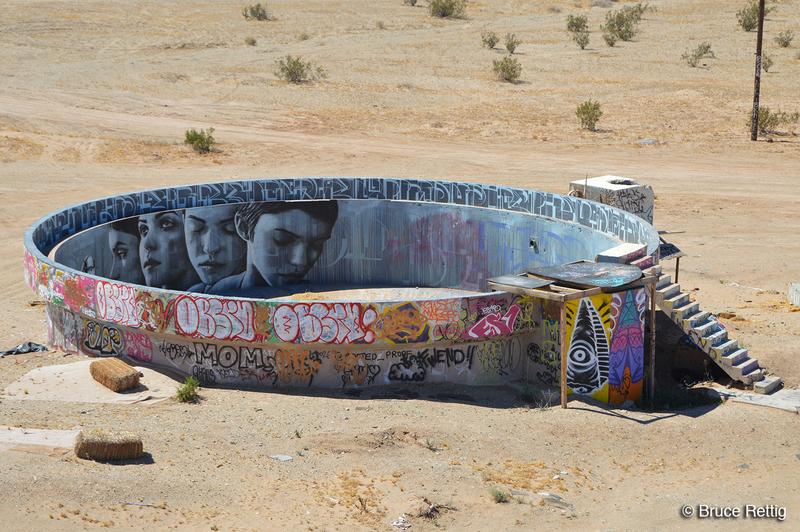 The coliseum, skate park, water tower, and various other sites, feature artwork born of desert debris, refuse, and detritus (yes, junk.) The successful morphing of these scraps into fantastical art is truly inspiring, and a testament to the creative spirit. 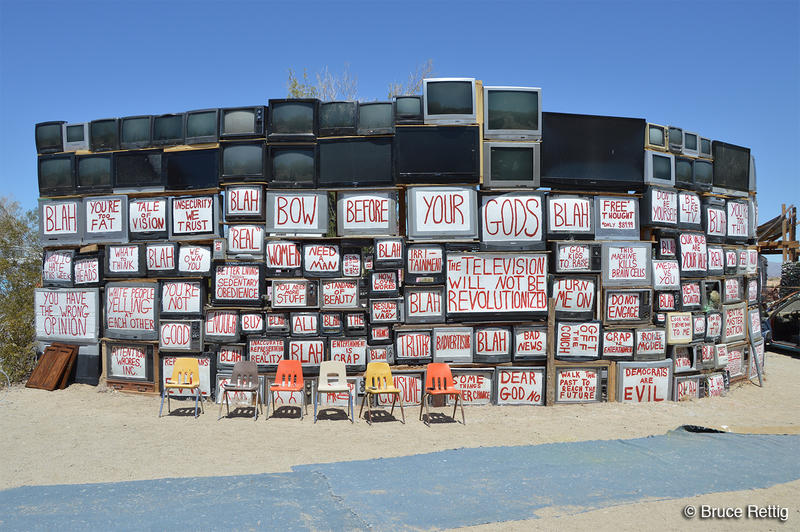 From vibrant graffiti and mural paintings, to a towering sculpture constructed out of old televisions, this is one of the most interesting open-air museums I’ve experienced. We later visited East Jesus, an experimental, sustainable, and habitable art installation. In early 2007, Charlie Russell (a frequenter of Burning Man) left his job in the technology industry, packed all his belongings into a shipping container, and sent it to a trash-strewn field. There, he began to surround his two art cars with sculptures that became the foundation works of East Jesus. Note: There is no religious connotation in the name East Jesus. It’s a colloquialism for a place in the middle of nowhere—totally off-grid. 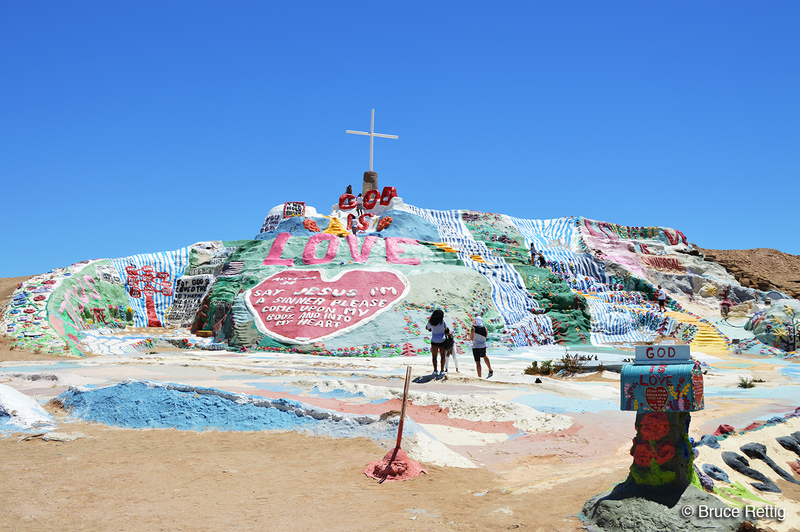 Our final destination on this part of the trip was Salvation Mountain, a man-made mountain twenty-eight years in the making, covered in half-a-million gallons of latex paint. 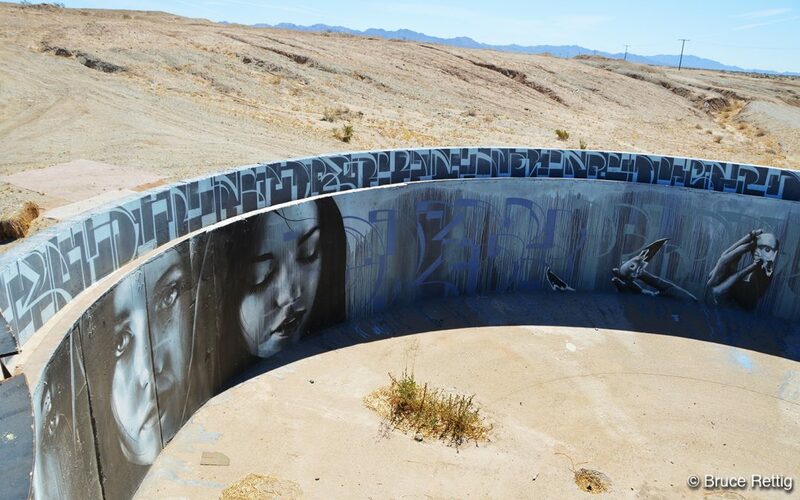 Created by Leonard Knight, the project began as a small monument made of dirt and painted cement. Over time, it became a sprawling adobe and hay-bale mountain complex. Knight gathered architectural ideas from the local Navajo, and the mountain served as his living daily meditation. His message was Christian but non-denominational: God is love, accept Jesus into your heart, repent your sins, and be saved. Leonard Knight passed away in 2014, and there are now efforts for preserving the site. As is most often the case, preconceptions about a place and its people can mislead and point one in a totally wrong direction. Once again, I had come to the realization that the “best practice” is to experience first, then take some time to digest what’s learned. Extended road tripping allows that process to proceed at a healthy and natural pace. Most helpful, is maintaining an open mind and an adventurous spirit. 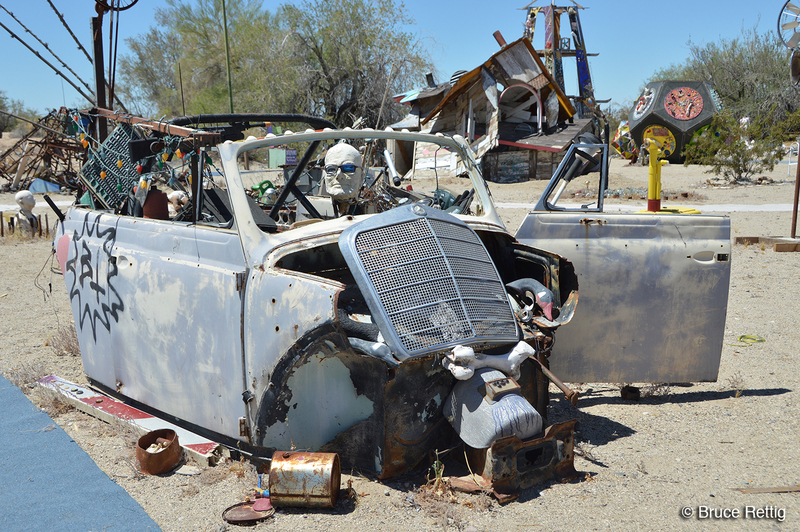 Thoughts of Slab City bring a smile to my face. I hope it remains forever free. 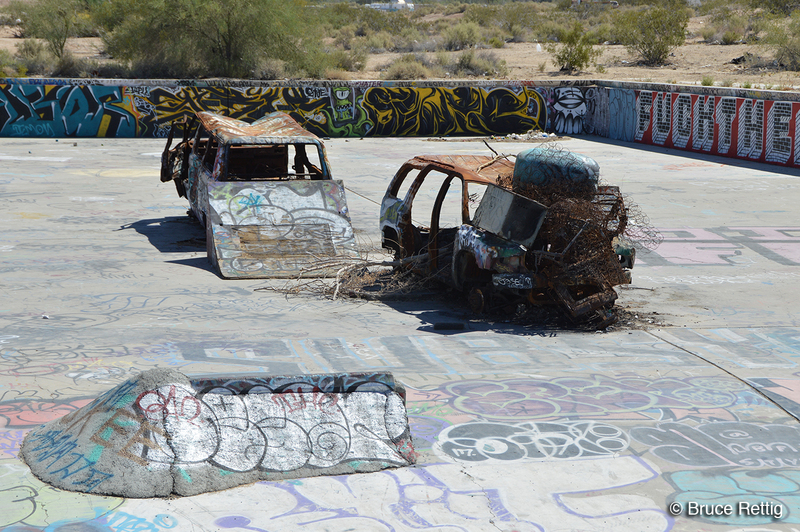 • Will Slab City Remain the Last Free Place in America? Friday night at The Range in Slab City. Our Airbnb at Slab City. Always have to visit the local library. 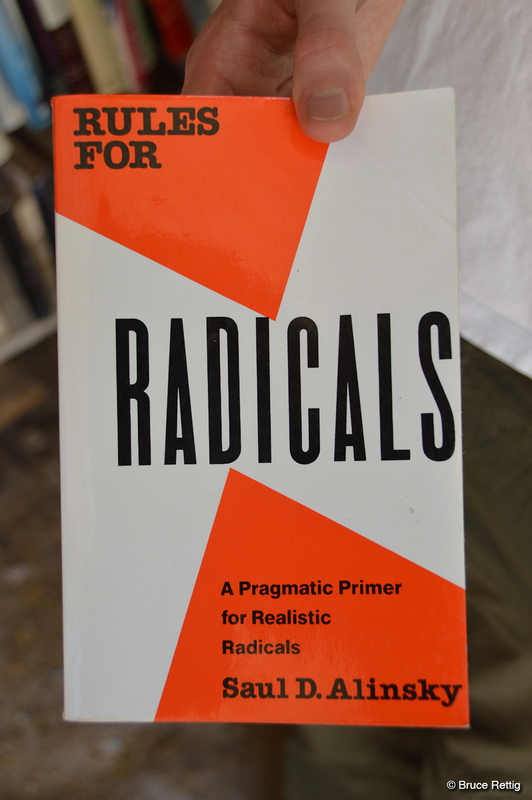 Maybe the best place to find this book . 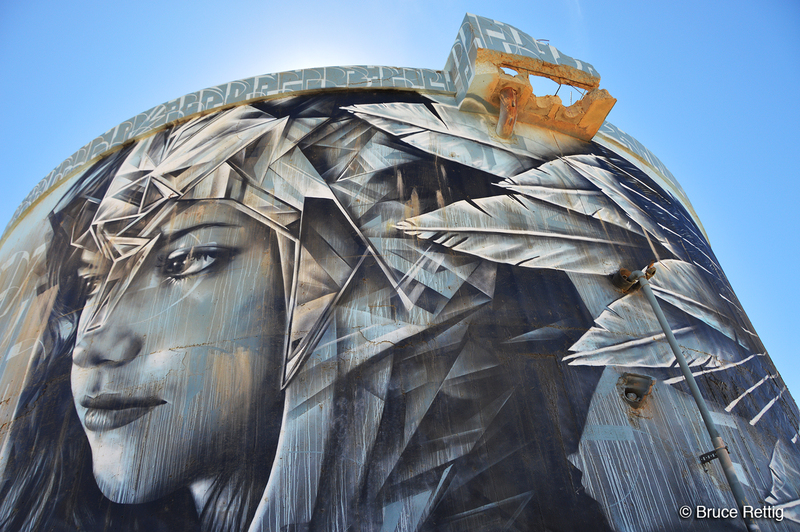 . .
A magnificent mural adorns the water tower (the gracious Slabber living inside the tower let me climb to the top for a nice view of the city and surrounding land art). What a pleasant place, supposedly in the middle of nowhere! Definitely a different view from out there . . . refreshing.